Butyl-based chemicals have been an industry standard for janitorial companies for decades. 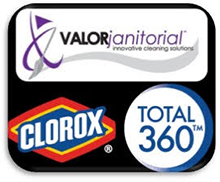 As awareness surrounding employee health and the damage butyl based products can cause when used improperly, janitorial companies are in search of alternative cleaning products. Oxygen-based products offer both a safe work environment and multiple uses. Additionally, oxygen based cleaners are safer for the environment; they have very low levels of volatile organic compounds. They are also not irritating to the skin. There are many types of oxygen cleaners available: Percarbonates, which are bleach oxygen cleaners and the more common hydrogen peroxide cleaners. Hydrogen peroxide cleaners are combined with surfactants and orange oil to increase penetration and reach embedded soil. Hydrogen peroxide based cleaners leave little behind to impact the environment or encourage dirt and grime to rebuild on left over residue that butyl-based cleaners leave behind. When a hydrogen peroxide cleaner comes into contact with a stain or soil, oxygen is released to dramatically increase cleaning power. Oxygen-based products are ideal for the commercial environment. Although they are not recommended for petroleum stains such as oil or gum, they are the best option for both porous and non-porous surfaces as well as tannin stains. The many uses for oxygen-based cleaners only increase their value when using in both commercial and home environments. Janitorial Companies in search of a superior product that will reduce employee errors and injuries as well as provide an effective cleaning solution will find oxygen-based products solve these issues.